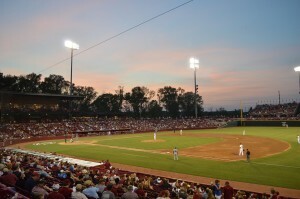 Ballpark Basics: A collegiate ballpark that rivals many Minor League parks. Our first indication that this would not be a typical collegiate game was when we started looking for tickets. The only tickets available on the team’s website were standing room only in the outfield. A look at the secondary market showed that tickets to the Gamecocks are a hot commodity in the capital city. We were happy to snag two outfield bleacher seats for a game against in-state rival The Citadel. The ballpark sits just off the main campus is is surrounded by parking lots full of people tailgating before the game. Yes, they even tailgate before baseball games in the SEC. USC won back to back College World Series in 2010-2011 and this is on display (literally) right when you first enter the park. The main entrance is in center field and they have created a large plaza to commemorate the College World Series wins with seats from Rosenblatt Stadium and a display case with both National Championship trophies. A walk around the wraparound concourse will show you a variety of seating options. Most of the seating is in the lower bowl with individual seats with seat backs. 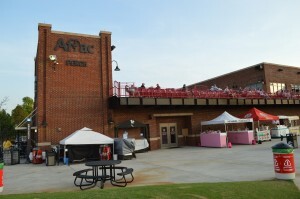 There is also a large bleacher section behind the left field wall, club suites above the main concourse and down the first base side, a picnic area in the right field that sits behind the berm seating section (sponsored by local food store Bi-Lo) that stretches around the right field corner. There is also a large children’s play area on the concourse in the right field section. This was by far the most popular area with families, kids, college students meeting up. Walking around the ballpark you sometimes forget that you are at a collegiate game. The game was being televised nationally on the SEC network and they had the game going on HD TV’s situated around the concourse and near the concession stands so you wouldn’t miss any of the action. There was plenty of staff on hand to ensure that there were no upgrades. 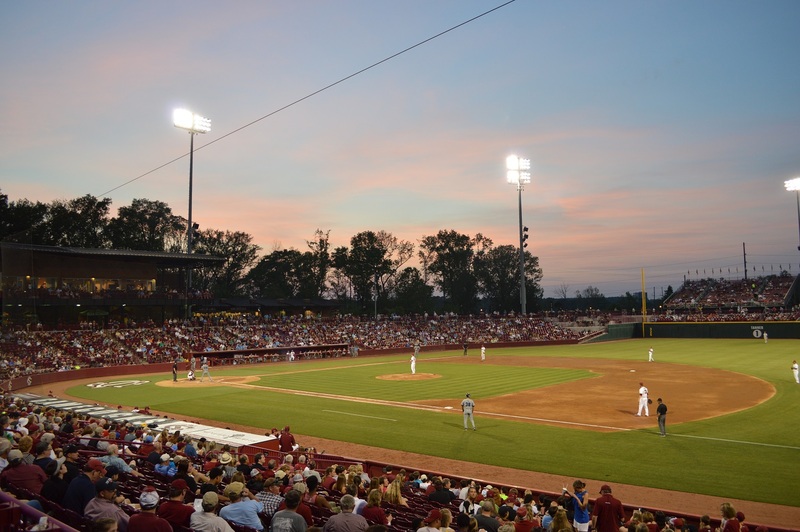 Being on a college campus there was no alcohol for sale at Carolina Stadium and this might be the only thing that would indicate that you were not taking in a game at a Minor League park. We are used to a very casual collegiate baseball experience where there is little to no charge for entrance and many of the seats are general admission. 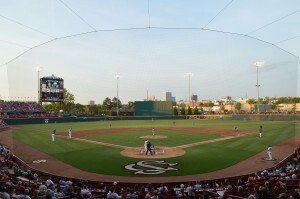 With almost 6,000 season tickets sold and a nationally contenting team it is easy to see why USC has built such a remarkable ballpark. Beer basics: A brewery that is very involved in the community, hosting creative events and helping to change beer laws around the state – all while brewing up some delicious beers. Although they don’t open until 4pm, we got lucky on the April afternoon we arrived. Having hosted an event for USC that was just wrapping up, they were fine with us sidling up to the bar 20 minutes early. 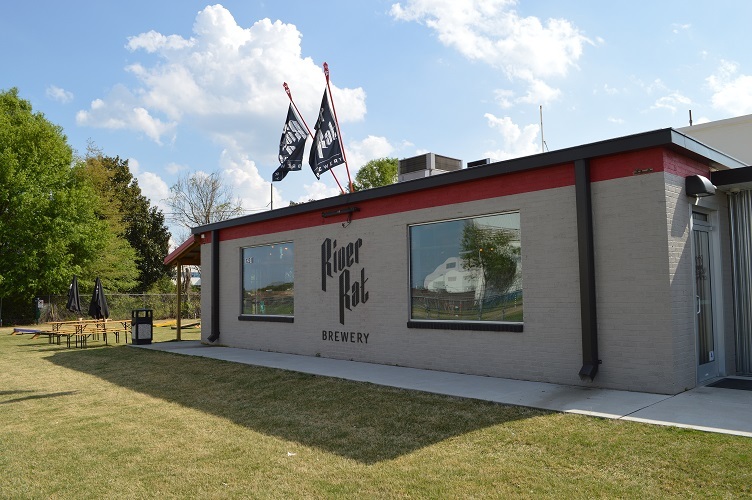 This laid back “why not” attitude is just one of the reasons to like the folks behind River Rat Brewing in Columbia. 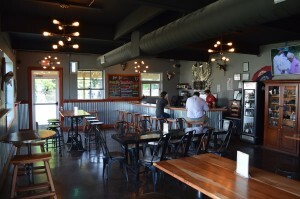 This is the kind of place you hope to find in your local brewery. Their flight has no limits, just pick any six on tap; they had a ton of their own and also five guest taps including a cider and yes, PBR. They’ve got bands that come in and fun activities scheduled throughout the year including their Adult Easter Egg Hunt which had been a huge success just days before. 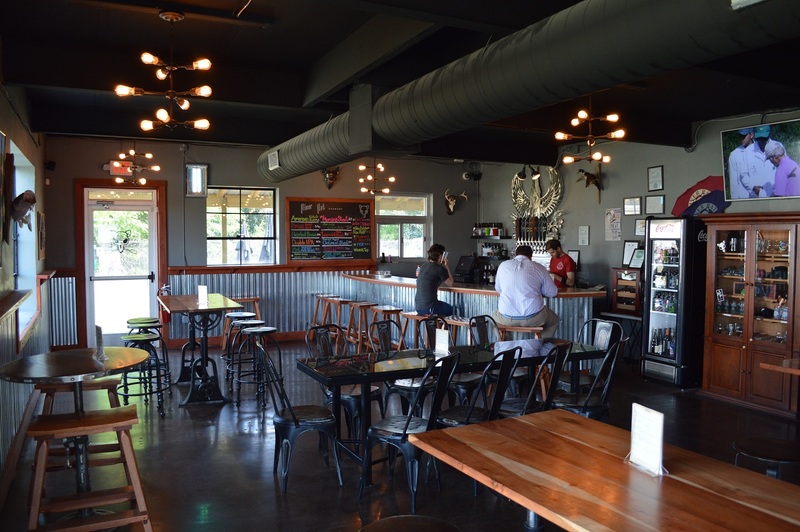 The building itself has a concrete floor, bar made out of onyx, corrugated metal chair rail to the floor and tall gothic metal stools at the tables, wood stools at bar. A very talented metal worker is also associated with the place, and you’ll find evidence of his work on the walls and in the incredibly unique bar back and tap handles. This place is growing quickly and thanks to new laws they can now expand. As recently as 2013, Carolina breweries were limited to producing 2000 bbls/year. The new “Stone Law” passed in hopes of making South Carolina more attractive to Stone Brewery as they searched for a east coast home*, increased that number to 250,000. Additionally, where breweries were once only able to give free tastings and sell limited amounts based on ABV, they can now sell in house. River Rat has personally been able to up their yearly totals to 4-5,000 gallons which has allowed them to expand their distribution farther across South Carolina with an eye on adding North Carolina to the list by 2017. Not bad for a brewery that’d only been open a year. *It didn’t work, our hometown Richmond was the lucky winner of the Stone Brewing bid(!). Nonetheless, our two cents says the Stone Law was a great idea. 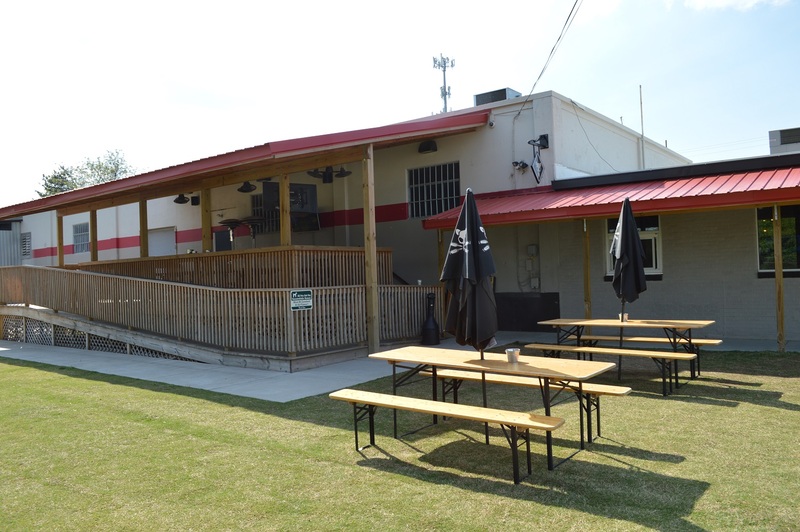 Not only will it likely draw a future bid from such an established brewing company, in the meantime it immediately improves things for the talented breweries already in the area. Broad River Red 5.4% ABV – Orangey color with lighter hued lacing. It sparkles in the glass and on your tongue. A light red that is malted and goes down very easily. Moncks Corner Abbey 7.1% ABV – Moncks Corner has a spicy citrus nose and a palate that starts with a hint of orange peel, with a spice kick at the end. It’s darker than the Broad River but with the reddish hue and spicy flavor we would have guessed this to be the red ale had we not known better. Lots of different flavor notes that blend well to make this another good option on the River Rat menu. Hazelnut Brown 5.3% ABV – A solid, brown color with just a tiny hint of orange/sienna, moderate carbonation and a ring of lacing that sticks. The hazelnut is both malted and nutty but neither flavor overpowers the other and it’s more of just a standard, balanced brown ale. Lost Port Vanilla Porter 6.0% ABV – Another very brown beer, without any of the light tint of the Hazelnut, and again, long lasting lacing. A sweet smelling bouquet gives way to a smooth malted porter that is very, very vanilla. The strong vanilla flavor starts upfront but is even more pronounced in the finish. One of our favorites of the day, so good we purchased more to take home with us! My Morning Stout 6% ABV – Dark, dark brown beer that smells dry and slightly woody. Again the bouquet matches the palate and the dry, roasted taste is not surprising, but that doesn’t make it any less delicious. Mint Imperial Milk Stout – Our only real “miss” of the day. It starts out well and smells like mint chocolate chip ice cream, but the taste is malt overlaid with strong, wintermint. Both the malt and mint blend at the end of the sip in a weird mix that is kind of like beer mouthwash.